A highly reliable and compact document scanner, the Xerox DocuMate 4790 scans up to 90 ppm and 180 ipm and includes a 200-page Automatic Document Feeder that accepts up to A3 (11" x 17") size documents and can handle nearly any mix of paper in various sizes and thicknesses. Its unique paper feed mechanism minimizes the possibility of damaging important documents and ensures precise feeding to make your office work even more efficient. The roller is designed for efficiency by separating itself from the page each time a sheet is fed, reducing the likelihood of drag and double feeds, and improving the useful life of the roller. A separate double feed prevention roller applies controlling pressure when paper 'sliding' (caused by buildup of toner or carbon on the rollers) is detected. The scanning glass is protected by the use of various sensors that detect stapled pages and automatically interrupt the scan process. It is also equipped with ultrasonic multi-feed detection and an innovative self-cleaning function that removes dust from the scanning glass to ensure consistently high image quality. The Xerox DocuMate 4790 has a convenient clamshell design that allows direct and straightforward access to the entire paper path, so a user can clear paper jams, clean the unit, or replace rollers easily without having to call a service technician. A pre-scan imprinter is also available for the Xerox DocuMate 4790 and is supported through the included TWAIN and ISIS drivers. The Xerox DocuMate 4790 provides both high-quality image enhancement and increased productivity with Kofax VRS™ Professional AIPE-EBC for auto-everything scanning, including Auto Rotation, Blank Page Deletion and Auto Color Detect. VRS Professional improves your workflow and reduces the total time required to finish even the largest batches of mixed documents. TWAIN and ISIS drivers are included to ensure compatibility with document management software and your capture applications. 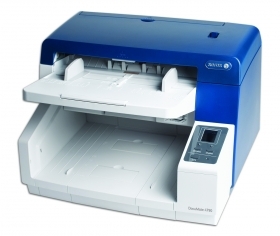 The DocuMate 4790 is powered by Visioneer OneTouch scanning technology for simplifying scan jobs and workflows. The scanner also has an easy-to-read LCD on the front that reminds the user of the resolution, color mode, file type, processing and final destination of the scanned document. You'll find the Xerox DocuMate 4790 to be the kind of advanced and reliable equipment you expect to come from Xerox. We wouldn't have it any other way.